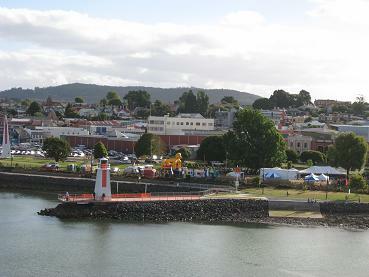 My Spirit of Tasmania trip was a wonderful experience, all 9 hours of it. Want to hear about my Spirit of Tasmania trip? You can read all about it here. Not only that, I have also put together some Spirit of Tasmania travel tips, just for you. Having decided that we wanted to experience a Spirit of Tasmania trip at least once, Greg (my husband) and I went online and made a booking. We booked about a couple of months in advance. We went with "Ocean View Recliners" since they sounded pretty comfy. You can take a vehicle along with you on the ship. However we had arranged to pick up a pre-booked rental car on arrival in Tasmania. We were dropped off at the Port Melbourne terminal around 7.30am. The departure was scheduled for 9am. 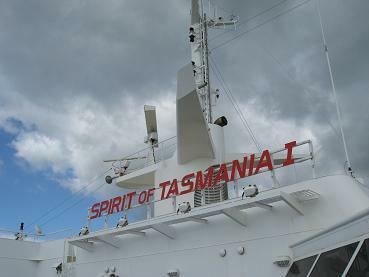 It was so exciting to see the Spirit of Tasmania I waiting there for us. On first boarding we found ourselves at the foot of an escalator. It sure seemed like we were in a building rather than on a ship! We explored the surrounds - found the eateries, bars, shops, cinema, games room and just made sure we knew how to get around. There was even a children's playroom where some little ones were already having a good old time! Going by the numbers that came out on deck, leaving Port Melbourne was considered a special occasion. 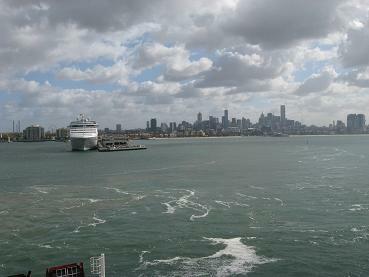 As the ship moved away, we watched Port Melbourne get smaller and smaller. We passed lots of sailboats happily enjoying the good sailing weather. For breakfast we got a couple of croissants and coffee from the cafe/bar on Deck 9. We ate out on deck so we could enjoy the magnificent views. In fact throughout the trip we found it hard to stay away from the deck areas. 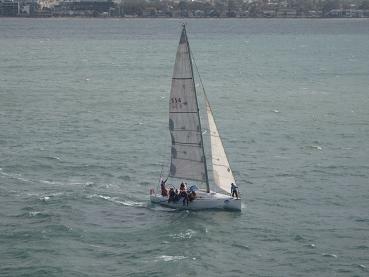 It was announced over the intercom that we would be passing through the Port Phillip Bay heads at 11.15am and passing the Spirit of Tasmania II around 2pm. The Spirit of Tasmania II would be traveling in the opposite direction. As I watched the Spirit of Tasmania II pass at 2pm I realised that this was just how our vessel looked. I wondered if there were passengers on the other ship taking photos of us? I watched it until it disappeared in the direction of Port Melbourne. 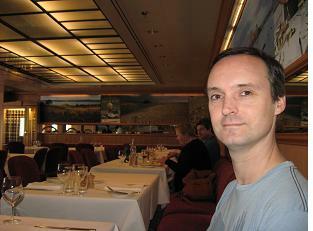 We had a lovely lunch in the Seasons restaurant. I had ravioli with porcini mushrooms in arrabiata sauce. Greg tucked into mediterranean risotto with pumpkin. We shared dessert - ice cream with Tasmanian berries. Everything was just yummy. That sea air builds up a good appetite they say. Perfect for enjoying delicious food. After lunch, we retired to our Ocean View Recliners, for a nap. Getting comfortable with the supplied pillow and blanket felt so good. We were able to recline the seat quite a bit, more than I expected. 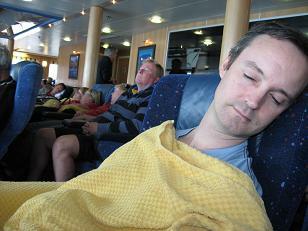 So it was pretty easy to catch 40 winks as the movement of the vessel rocked us to sleep. We felt very refreshed when we awoke. Land ahoy - we could see Tasmania! This was getting even more exciting. I watched the beautiful island draw nearer and nearer. Devonport looked oh-so-lovely as we slowly headed for the dock. When we had berthed we stayed on deck for a while watching the ship workers do their jobs. Soon the first cars started to drive off the vessel. It was over, but we had thoroughly enjoyed our Spirit of Tasmania trip. What a great way to start what we knew would be yet another fun-filled holiday on this treasure of an island.